Thank you for checking review #71 by Cardboard Clash. My aim is to focus on reviewing board games and how they play for two people and, on occasion, how they play for one person. Because my wife is my primary gaming partner, a lot of consideration goes into finding those games that play well with 2 players, and we typically prefer to find those games that do not require a variant (official or otherwise) in order to play it with just the two of us. **Note: a review prototype of the game was provided in exchange for an honest review. Dreams of Tomorrow is a game designed by Philip Falcon Perry and will be published by Weird Giraffe Games in 2019. The box states that it can play 1-6 players and has a 45 minute play time. You are playing against the score of a Robot player, who has three difficulty ratings available. Each Robot difficulty has a different set of instructions, which essentially tell you how many spaces it will move, what types of spaces it will stop on (hint: it stops on the same 2 space types for all difficulties), what happens when it does its action. It also has you use two cubes of another color to track its turns which, essentially serve as a method for its score. So while this robot is not competing for scoring the same way as the player, it serves as a clock for the player and a measurable bar to try and overcome for scoring. It forces the players to strike a balance between scoring points and ending the game quickly. I feel as though I cannot comment on this, as I am credited as one of the contributors to help go through and provide edits and suggestions regarding the rules. Needless to say, I feel they are done well and will be going through them at least one more time now that I have a few more plays of the game under my belt. The rondel system in this game is delightful, and I wish more games would implement rondels. Your meeple moves around this rondel of 4 cards, spanning 8 spaces. Where you land often provides a benefit for you, as well as a benefit for everyone else (Robot players do not gain benefit from your moves, but you can benefit from their moves!). You can move 1-3 spaces for free on your turn, and you can spend those easy-to-gain resources to move further. What really sets that rondel apart, though, is that it will not always stay the same. The cards are double sided, and you can gain abilities to flip and/or move the cards, and the Robot will have ways of doing the same. That action space you were planning to use next turn might suddenly be a long ways away from you, requiring an expenditure of resources or taking several turns to get there – all the while hoping it doesn’t move again before that happens. It can be frustrating in all the right ways when your perfect plans get foiled. The resonance for the set collection is interesting, and was something that I struggled to fully grasp in editing the rulebook. However, it took almost no time during gameplay to figure out how this works. It sounds like there are a ton of points to be scored here, however there is definitely a cap on there. See, each specific card has 4 copies in the deck, meaning that you can never score a set of 5 on both the top and the bottom. It is simply impossible. Which means the best you can hope for is a 5 and a 4, which would require getting all 4 of the exact same card, and one that matches either the top or bottom resonance. That was my first game, by the way. Most games after that had a 4, with the other half getting a 2 and a 3 as a pretty common result. One of the best things here is when you weave a dream. This is where you take a dream you’ve caught previously and add it to your eventual string of 5 dreams that you want to have at the end. On one side of every card is its action. When you weave a dream, you can add it either at the far left of your sequence, tucking that action under the other cards and removing it from your selection. Or you put it at the far right, making that the new ability you have. Granted, you can use the ability of dreams you’ve caught and not woven, but I like the decisions presented here as you’re trying to keep a useful ability while working on that set collection aspect. Night Mare Mode. Seriously, this adds so much fun to the game, making a mostly predictable sequence of events just a little more interesting. If you love being able to perfectly math out your turns 3-5 in advance, you’ll probably never use this mode. The Robot on its own can muck things up enough as it is. But you’ll be missing out on a fun variant for the game by skipping over this mode. The resources are too freely in abundance. I get it was a design choice, but it made it feel too easy to access the higher-point cards. Either they should cost more to gain and build, or the resources should be tapered down just a little. I’m sure it took a lot of playtesting to get here, and that the balance feels better at a higher player count. Then again, with 5 other players potentially triggering resources for you I don’t see how there can ever be an absence of resources. That abundance of resources makes it equally confusing as to why anyone would ever want to take a 2-point card when they could take a 4-5 point card for just a little more in every resource. The only time I did it was when I was trying to end the game and a card in the rondel was moved, making me choose between getting what I could buy now and end the turn on the next round, or play a full cycle around the board. I probably just don’t have the right mentality, situation, or player count to understand it…and that’s okay. But unless I really need the card for set collection, I’m likely to look at my other options instead. The Robot’s score is heavily influenced by its turn tracker. I’m not going to say that I cheated, but I’m convinced that I miss moving its cube at least once per game. Its action is just so quick and easy to do, that I jump to that and sometimes forget to do that small, simple bookkeeping. If you are as prone to human error as I am, this could be a problem for you as well. And since it affects both its score, and what happens on certain actions, this could affect your overall experience (even if you never realize it). Bumping is also a very, very dangerous thing to consider. I’m all for language independence in games. I’m not going to say this game has iconography on a Race for the Galaxy level or anything, but it has some pretty heavy iconography. So much so that it takes both sides of a card to show them all. However, that isn’t even the real issue. The problem comes in there being only two of these in a game that plays up to 6. Solvable problem here, and I hope they consider adding in extras so that each player can have one. I wasn’t supposed to be interested in the game. It always sounded a bit simplistic for what my wife and I usually try out, but after I read the rules I knew it stood a chance. Because the rules didn’t provide much info about the solo play, it had me curious. When Carla asked if I wanted to review the game, I said yes mostly on the strength of the solo experience from both Stellar Leap and Fire in the Library. Carla does it again with developing a solo mode that is interesting, challenging in the right ways, and leaves you ready to challenge it again. I wasn’t convinced after my first play against the Easy difficulty, but I’ve come to accept that I had a perfect run of luck on that one based on the other plays since that one. The Medium mode cranks things up enough to make you uncomfortable, and Hard is downright frustrating to any plans you’re hoping to make. In all the right ways. They all use the same core mechanics for the Robot player, just refining what happens when the Robot does certain things. Which is why Hard takes 2 cards. I’m here to say that Carla from Weird Giraffe Games is designing some underrated solo experiences, and if you play solo games at all you NEED to pick up one of these games. This one has the least input randomness of the three I mentioned, and it still delivers an unpredictable and fun experience. And then comes the Night Mare. Holy crap, that takes a fun game and cranks it to eleven. Well, unless you hate randomness. My wife would never play with the Night Mare mode. I would guarantee that right now. But for a solo game, sometimes adding in that extra element really enhances the experience. Dreams of Tomorrow is a nice, fun, light game with amazing aesthetics. I love rondels, and this one has a small but pleasant rondel that sees plenty of use during your plays. This would be a great game with more players, but the fact that it stands up as a solo game is reassuring. If you want a game that is quick to setup and play, looks great on the table, and has multiple difficulties to challenge your abilities – this is a game you should definitely check out. Hopefully you found this article to be a useful look at Dreams of Tomorrow. 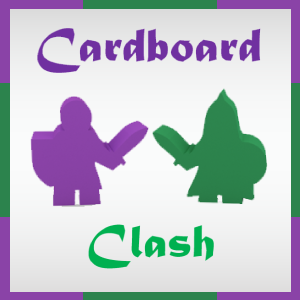 If you’re interested in providing support for Cardboard Clash so I can continue to improve what we offer, check out my page over on Patreon: http://www.patreon.com/CardboardClash.